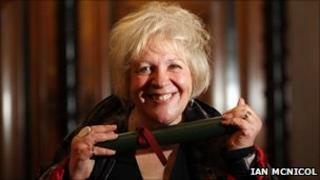 Image caption Liz Lochhead described her new post as "an enormous honour"
Liz Lochhead has been confirmed as the new Scots Makar, or national poet. The 63-year-old follows on from Edwin Morgan who died, aged 90, last August. He had held the post since it was created in 2004. Ms Lochhead, originally from North Lanarkshire, is a widely recognised poet, author, translator, playwright, stage performer and broadcaster. Her first official engagement will be to open the new Burns Museum in Alloway on Friday. "I am as delighted as I am surprised by this enormous honour," she said. "I accept it on behalf of poetry itself, which is, and always has been, the core of our culture, and in grateful recognition of the truth that poetry - the reading of it, the writing of it, the saying it out loud, the learning of it off by heart - all of this matters deeply to ordinary Scottish people everywhere." Ms Lochhead will stand down from her post as Glasgow's Makar in order to fulfil the new role. The artist was born at Newarthill, near Motherwell, in 1947. She studied at the Glasgow School of Art and taught art at schools in Glasgow and Bristol. She was Writer in Residence at Edinburgh University from 1986 to 1987 and Writer in Residence at the Royal Shakespeare Company in 1988. Her first collection of poems, Memo for Spring, was published in 1972 and won a Scottish Arts Council Book Award. The artist is a fellow of the Royal Scottish Academy of Music and Drama, the Glasgow Institute of Art, Glasgow Institute of Architects and the Royal Incorporation of Architects in Scotland. She also holds honorary doctorates from 10 Scottish universities. Ms Lochhead was confirmed in post by First Minister Alex Salmond and former first ministers Lord McConnell and Henry McLeish at the National Library of Scotland in Edinburgh. Mr Salmond said: "As an author, translator, playwright, stage performer, broadcaster and grande dame of Scottish theatre, Ms Lochhead embodies everything a nation would want from its national poet. "With a natural ability to reach all ages and touch both sexes through her writing, Ms Lochhead has also been immensely successful at championing the Scots language. "She continues to reach out to school pupils through her work which is widely read in Scotland's schools and she is also a much valued role model, advocate and inspiration for women who are given a strong voice in her writing." Ms Lochhead was selected from a shortlist recommended by a committee of representatives from Scotland's literature community. Robyn Marsack, director of the Scottish Poetry Library, said: "As National Poet, Liz Lochhead will be a great ambassador for the poetries of Scotland - past, present and future. "We are delighted to be working closely with her in her new role, furthering the Scottish Poetry Library's aim of bringing people and poems together." Andrew Dixon, chief executive of Creative Scotland, added: "The appointment of Liz Lochhead as national poet sends out an important message about the role which artists play in celebrating the culture of Scotland. "She commands enormous respect from the literary community and is held in huge affection by the Scottish public."